The textbook content on offer has been approved by SAMSA as syllabus textbooks for Marine Engineering education, and have been specifically written to cover the IMO/SAMSA code requirements. Available from Amazon.com or through this website. Both the syllabus textbooks and the Question & Answer books have been written to cover the Marine Engineering Syllabus as prescribed by the IMO, and SAMSA codes in South Africa to include the Manila 2010 amendments that were introduced. All of the sketches in these books have be drawn in an easily understandable manner, with the intention of making them easily replicable for student assessment and examination purposes. The books aim to provide information that can be used by students (i.e. drawn sketches), for both level II and level III assessments. At the end of the books are examination questions for every chapter that have been asked over the past number of years in South Africa. Due to complications and delays with the sourcing of internationally available textbooks, the following textbooks are available in South Africa, and can be shipped anywhere within South Africa via overnight courier. For the forthcoming academic year, the following textbooks are available for South African Marine Engineering students. Chapters: Materials, Fuel & Lubricants, Ship Handling, Power Transmission, Refrigeration, Pumps & Pumping Systems, Safety & Safety Systems, Instrumentation & Control, Watchkeeping, Ship Maintenance & Management, Management. 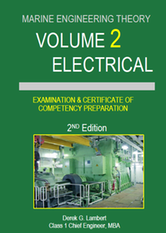 Chapters: Electrical Power Generation, Electrical Power Distribution, Motors & Starters, Electrical Circuit Testing, Ancillary Supply Systems, Tanker Systems, High Voltage Systems, Electrical Propulsion Systems. 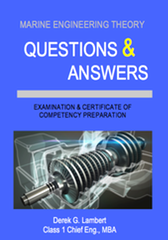 Chapters: Basic Principles, Bedplates & Crankshafts, Bearings, Lubrication, Liners, Pistons & Piston Rings, Cylinder heads & Camshafts, Fuel Injection, Turbocharging, Emissions Control, Air Theory, Management, Gas Turbines. Chapters: Marine Boilers, Marine Boiler Operation, Boiler Water Treatment, Boiler Failures, Feed Systems, Marine Steam Turbines. GENERAL: Materials, Fuel & Lubricants, Ship Handling, Power Transmission, Refrigeration, Pumps & Pumping Systems, Safety & Safety Systems, Instrumentation & Control, Management. 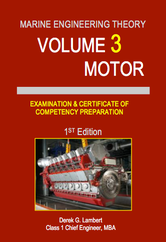 MOTOR: Basic Principles, Bedplates & Crankshafts, Bearings, Lubrication, Cylinder Liners, Pistons & Piston Rings, Cylinder Heads & Camshafts, Management, Fuel Injection, Turbocharging, Emissions, Air Theory, Gas Turbines. 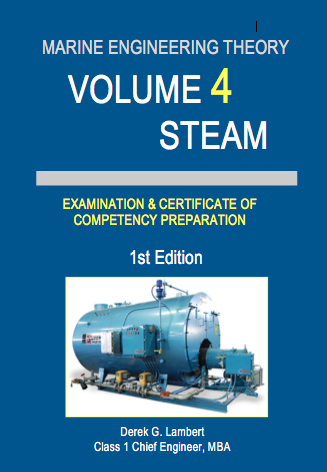 STEAM: Boilers, Steam Turbines, Feed Systems. ELECTRICAL: Power Generation & Distribution, Shipboard Electrical Systems, Electrical Propulsion.